If you’re a 90’s kid, you most likely grew up using AOL Instant Messenger (AIM) to chat with your friends. Almost all of us can remember coming home from school, booting up the family computer, and immediately signing onto AIM to catch up on the latest gossip. You might have even used it to talk to new friends you made on the Internet, too (whether or not your parents approved of it). While there were other instant messaging services, such as ICQ, Yahoo!, and MSN, AIM reigned supreme. Unfortunately, it’s now time to say goodbye to AIM. AIM is finally signing off. On October 6th, AOL announced that as of December 15th, 2017, the instant messaging service will be discontinued. The buddy lists and data of every user will be deleted that morning. If you still use AIM, be sure to save your files, images, and chat logs before you lose them forever. Let’s take a walk down memory lane to reminisce about the impact AIM had on our lives. Here are 8 reasons why we’ll miss this iconic instant messaging service. AIM was the program to chat with everyone you knew. Hiding behind your screen name also made it a lot less intimidating to talk to your crush. 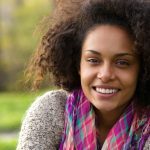 You might have even confessed to them over instant message, then played it off cool when you got rejected. There was nothing like pretending that your friend hacked into your account and sent those messages. Plus, what would AIM have been without chatspeak? It’s because of instant messaging programs that terms like “LOL,” “OMG,” and “WTF” are widely accepted now. Abbreviations like “G2G” and “TTYL” also made it easy for us to tell our friends that we had to sign off in case we had a “POS” (parent over shoulder). One of the simplest ways to meet new people on the Internet was by joining AIM’s chat rooms. You could find one for almost every interest or topic, such as gaming and cooking. In addition, there were chat rooms for singles of all walks of life. In a way, AIM helped normalize Internet dating. The only draw was that it was sometimes impossible to know who really was on the other side of the screen. While you can now run a background check in a matter of minutes, all we had to rely on back then was “A/S/L?” It may not be as easy to chat with online strangers as it used to be, but it’s definitely safer today. d0NT crii becuz itz 0VER. AIM had some of the best personalization options out there, letting an entire generation of kids and teenagers express themselves online. Unlike Facebook Messenger and other modern apps, you could change the font color and background of your messages, profile, and away messages. And we all know that an away message wasn’t complete without some moody lyrics. 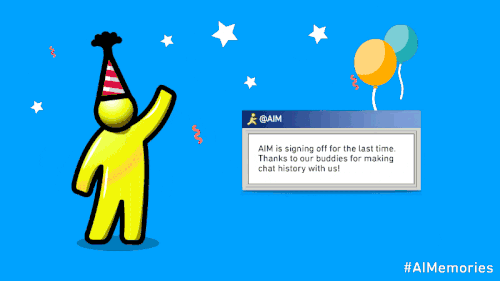 Saying goodbye to AIM means remembering the things we did that now make us cringe. Buddy icons also let us represent ourselves with whatever image we wanted, even animated ones. Fortunately, there were countless websites out there with buddy icons and custom layouts to choose from. When all of your friends were online, making a group chat went without saying. Instead of talking to them all in individual windows, you could bring them together in one chat window. It was a great alternative to three or four-way phone calls, and sometimes you’d even meet new people through your friends. Remember LiveJournal? Or, if you were on the goth side, DeadJournal? How about Angelfire, Tripod, or GeoCities? Chances are, you had a website or blog on one of these websites. And it was probably about Beanie Babies, Harry Potter, or horses. Your AIM profile or away message was the best way to plug a link to your personal site for all of your friends to see. Before Cleverbot, Siri, Cortana, and Alexa, there was SmarterChild. It was the chatbot we’d all talk to when none of our friends were online. SmarterChild was basically a one-stop source for news, sports, movie times, stock information, weather, and much more. Aside from these helpful features, you could also just have normal, casual conversations with it. Most of the time, it resulted in some pretty hilarious responses. While we’re only just saying goodbye to AIM now, SmarterChild was shut down years ago. In the 90s and early 2000s, the easiest way to share files with your friends was through AIM. Found a really cool song on Kazaa or Napster? You could send it using AIM. If you used the program’s Direct Connect feature with one of your friends, files would transfer much faster. Plus, you could even voice chat. Not only were screen names fun, but they let us be anonymous. You could message someone you met over the Internet without revealing any of your personal information. They’d only know you as “XxtHeBlAcKpArAdEXx” and nothing else. And if you decided you wanted a new handle, it was easy to make another screen name and link it to your old one. Sadly, there just isn’t a need for desktop instant messaging anymore. Smartphones and tablets have made it obsolete; now, you can message anyone at anytime, regardless of whether or not they’re actually using the Internet. Apps like Facebook Messenger have made us connected virtually 24/7. As we say goodbye to AIM, we remember a time when our buddies could see that we were online, but busy or away from the computer. Just a few years ago, MSN Messenger also ended its services and merged with Skype. What sets Skype apart as an instant messaging service is its emphasis on free video and phone calls. Who knows how long that will last, though, given the popularity of FaceTime and Facebook’s video calling feature. Back in the 90s and early 2000s, the Internet was all about customization. You could express yourself with custom icons, emoticons, and backgrounds. Nowadays, most people use Facebook Messenger and texting, neither of which offer much in the way of customization. While many of us haven’t used instant messaging in years, it’s still hard to say goodbye to AIM. Want to share the fun times you had on AIM with the world? Use the hashtag #AIMemories on Twitter, Instagram, Facebook, or Tumblr. Be sure to share your AIMemories in the comments of this post, as well!